Andrew Smith is coming to O. Henry on April 1st at 10am! He is the author of several young adult novels including: 100 Sideways Miles, Winger, andStand-Off. He has a new middle grade book coming out March 27th, The Size of the Truth. Buy a copy of his new book by filling out this form to get a personalized signed book during his visit. Cash, checks, or credit card are acceptable. We're looking forward to an awesome visit! A boy who spent three days trapped in a well tries to overcome his PTSD and claustrophobia so he can fulfill his dream of becoming a famous chef in this charming novel that is Andrew Smith's first foray into middle grade storytelling. When he was four years old, Sam Abernathy was trapped at the bottom of a well for three days, where he was teased by a smart-aleck armadillo named Bartleby. Since then, his parents plan every move he makes. But Sam doesn't like their plans. He doesn't want to go to MIT. And he doesn't want to skip two grades, being stuck in the eighth grade as an eleven-year-old with James Jenkins, the boy he's sure pushed him into the well in the first place. He wants to be a chef. And he's going to start by entering the first annual Blue Creek Days Colonel Jenkins Macaroni and Cheese Cook-Off. That is, if he can survive eighth grade, and figure out the size of the truth that has slipped Sam's memory for seven years. Read for the 12 days of the Read-A-thon, find a sponsor, record pages or minutes! Just $3 buys a brand new book for a child here in Austin! 3. On next screen, select O. Henry Middle School if it shows up, if not select “My school isn’t listed” and type in O. Henry Middle School. 5. Once in Sora select “Ok!” and you can look through all of the collections of ebooks and audiobooks. Enjoy! Come see Ms. Cross in the library with your device and she will help get you set up. Didn’t work? Come see Ms. Cross in the library with your device and she will help get you set up. 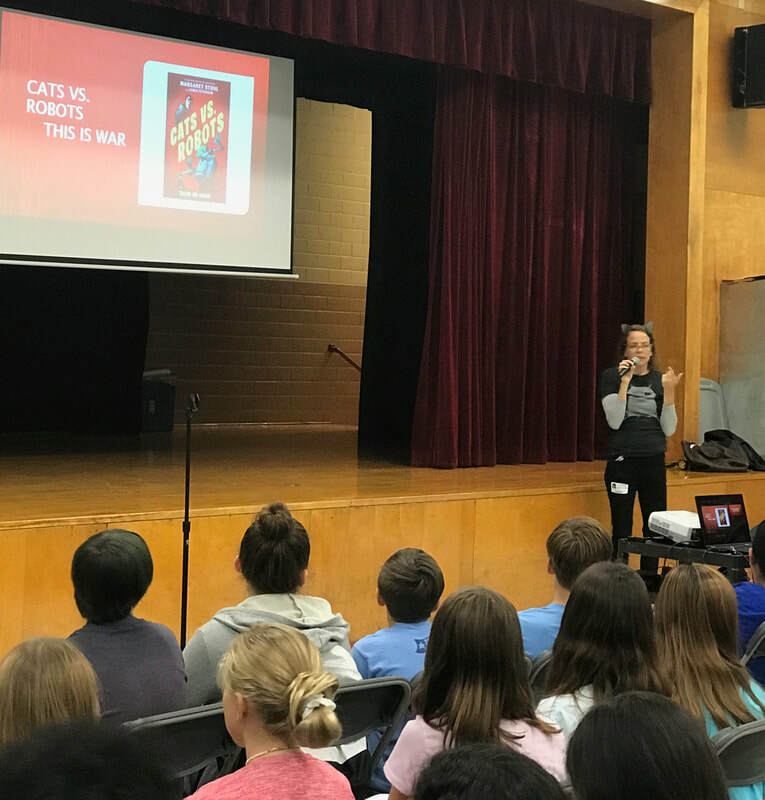 Margaret Stohl came to O. Henry and brought robots! Margaret Stohl is coming to O. Henry September 18th! Margaret is a bestselling author of twelve books for children and teens, including Beautiful Creatures and her new novel, Cats vs. Robots. She spoke to our students about writing for all different genres, like video game creation. We had a blast! Check out our new AISD Library Catalog! Try out new more online ebooks! Click MyOn icon below. MackinVIA DIGITAL EBOOKS! Another way to download ebooks and audiobooks for FREE! Download FREE app. Click on icon below. Teachers: Log in with your AISD credentials. Follow the amazing work of our students at the O. Henry Writing Project. Better yet, submit your work! The Hate U Give Movie Trailer! Click icon below for MORE Gale Reference Links!